They were six normal teenagers linked only by their wealthy parents' annual business meeting�until a chance discovery revealed the shocking truth: their parents are the secret criminal society known as the Pride! For years, the Pride controlled of Los Angeles' criminal activity, ruling the city with an iron fist�and now, with their true natures exposed, the Pride will take any measures necessary to protect their organization - even if it means taking out their own children! Now on the run from their villainous parents, Nico, Chase, Karolina, Gertrude, Molly and Alex have only each other to rely on. And they must not only survive on their own, but also somehow take down their own powerful parents�before it's too late! Brian K. Vaughan and Adrian Alphona craft a thoroughly modern take on the conventional 'teen-team' comic! 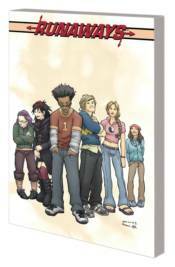 Collecting RUNAWAYS (2003) #1-18.